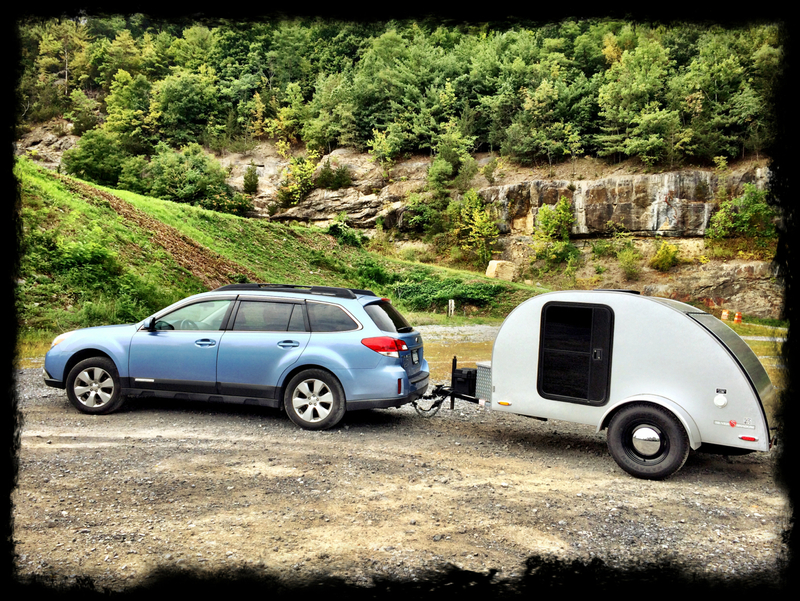 Our Teardrop is a “Silver Shadow” 5’x8′ model. It was manufactured in the Amish Country of Northern Ohio by Pleasant Valley Trailers (now called nüCamp RV) who used to make Little Guy Silver Shadow trailers and now mainly focus on making T@B and T@G trailers as well as Cirrus Truck Trailers. 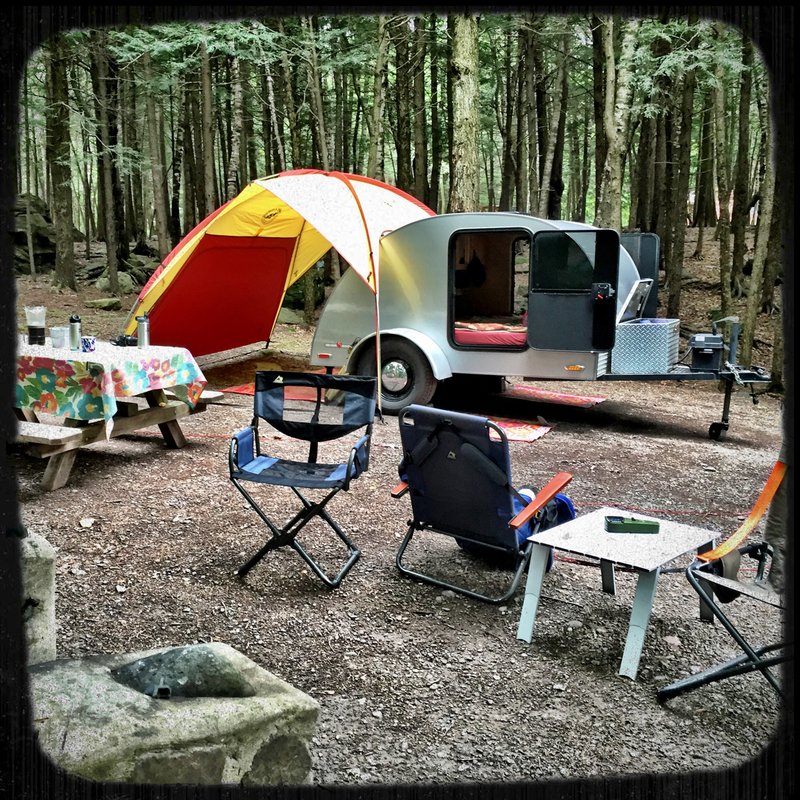 We bought it from the super nice folks at Miller Trailer Sales in Perkaskie, PA. Little Guy and Silver Shadow trailers are now made by Liberty Outdoors and you can find out more at Go Little Guy. 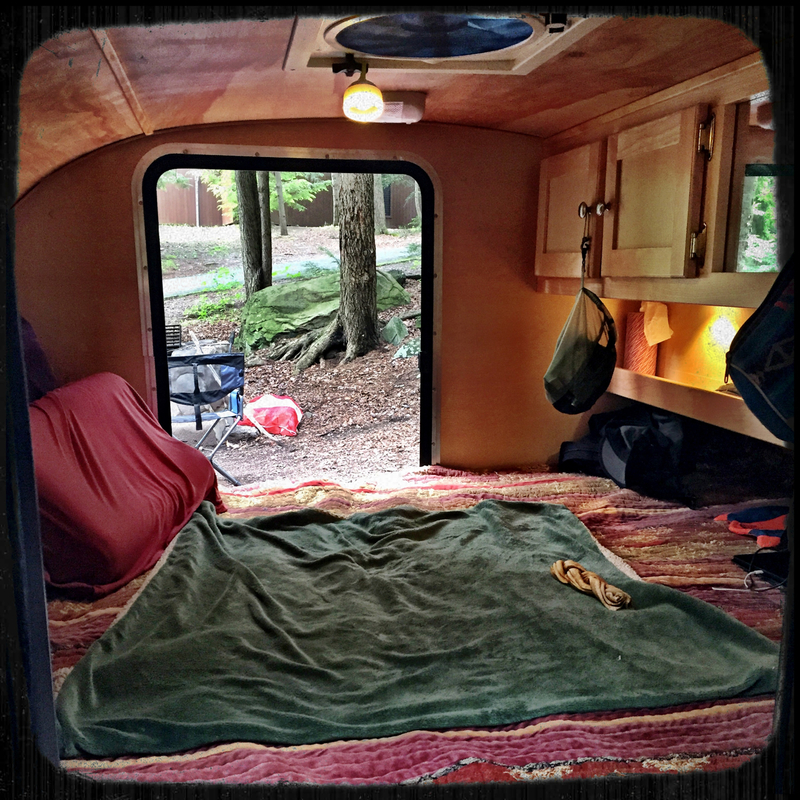 It has a queen sized bed inside and beautiful birch woodwork and cabinetry throughout. The main cabin has a ceiling window with a fan and four cabinets to store towels and clothes. There is also a shelf under the cabinets that is just right for drinks, tissues, lights and various small stuff. There are two roof lights and electric inside. One of the cabinets has a mirror that is perfectly situated for hanging an iPad that can be used for movies and TV. Under the mattress on each side is access to about 4 inches deep of underbed storage. It isn’t easy to get to, but it is perfect for storing tarps, spare blankets and other things you don’t use often. The trailer has an aluminum outer finish that is a combination of materials. Doors with windows and screens on both sides make it easy for two people to be about to get in and out of bed. There is a simple kitchen galley in the back that can be accessed by popping up the back hatch. All of our cooking gear, dishes, cleaning supplies, water and lights are stored here. 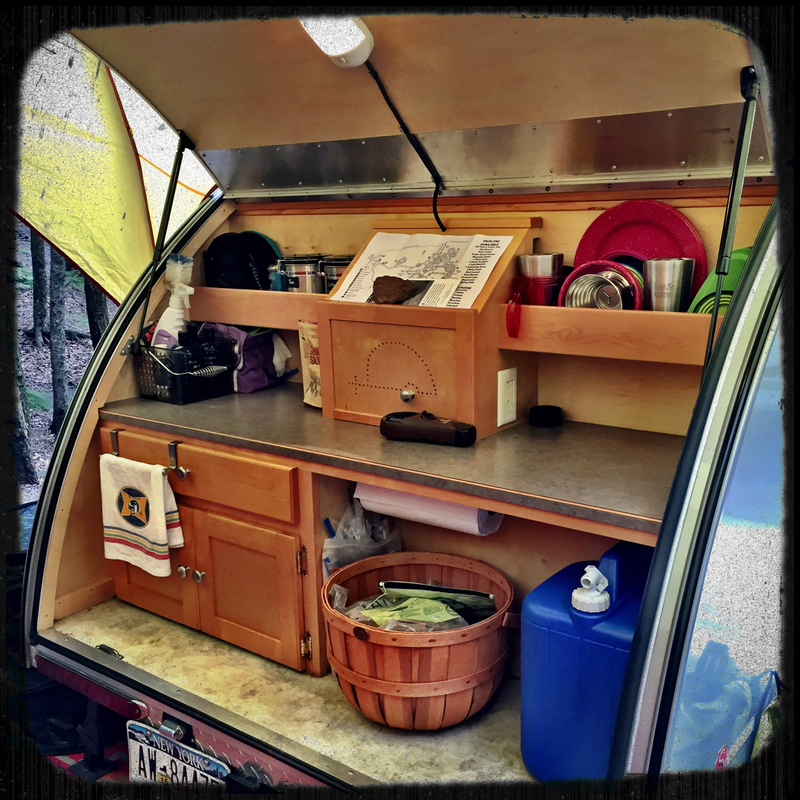 It makes a great food prep area both at camp and on the road. You can also access the power inverter from the galley in order to charge devices. You can get these trailers with much fancier galleys, but we find that this simple one is perfect for us. 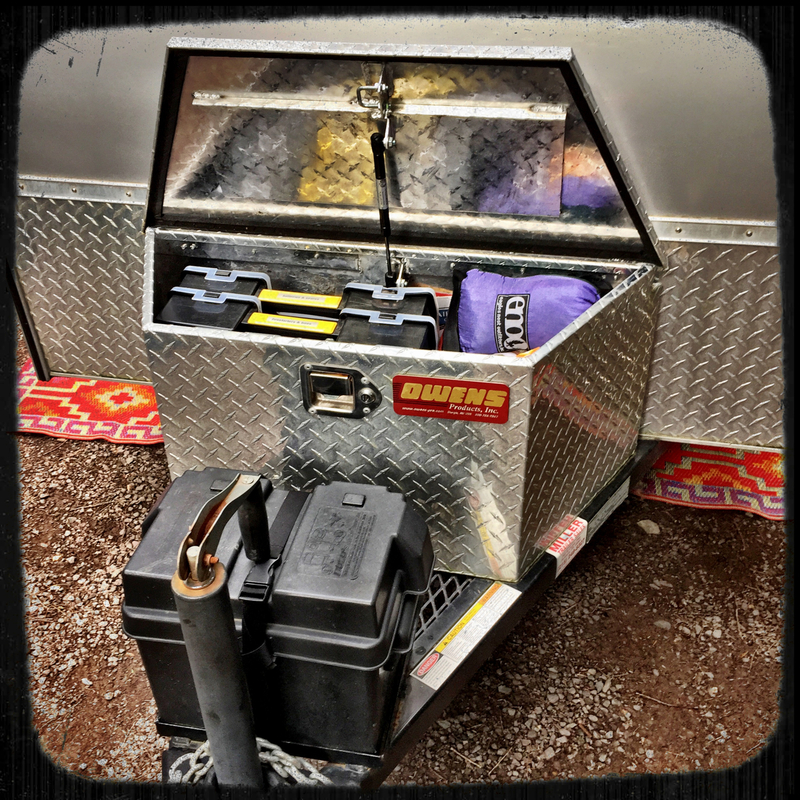 There is a metal storage box in the front on the trailer hitch that is a great place for storing all the tools and gear that we don’t want to keep in the kitchen. There is a marine battery and an electric hookup so that we have electric for the ceiling fan and other devices regardless of whether we are on or off the grid. We also carry a couple of solar panels and another battery for those times when we need to be off the grid for more than a few days. You can get Silver Shadow models that come in a slightly larger size (2 ft. longer) or with more amenities (kitchen sink and stove). 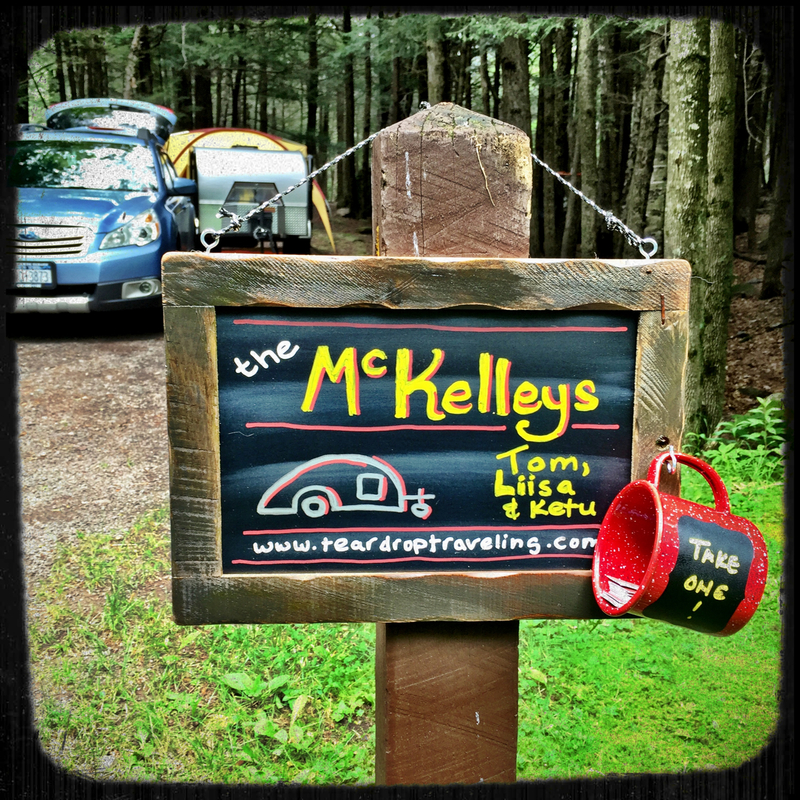 But we have found that we like using a mix of tent camping and trailer camping methods and we prefer cooking outside the trailer to keep things clean. The short length makes it easy for us to pull across two parking spaces in a lot and easily park where a longer or wider trailer might present more challenges. Our Silver Shadow is perfect for the two of us (and our shih tzu!) and pulls easily behind our Subaru Outback. Wonderful…What kind of fly do you have for your kitchen area and where did you find it? Debbie- We use the Big Agnes Three Forks shelter for our kitchen area. We bought it on Amazon after much research and having tried several other setups. This one seems to be the best we’ve found so far in terms of packing up really small, being easy to setup and keeping things pretty dry. Read more about our various rain setups here.